Colostomy reversal for restoration of intestinal continuity after a Hartmann’s procedure is considered a high-risk procedure associated with significant perioperative morbidity and mortality. Traditionally, colostomy reversal necessitated the use of a midline laparotomy. Laparoscopic reversal has emerged as a minimally invasive alternative. Current literature suggests laparoscopic reversal compares favorable to open reversal with shorter hospital stays, lower morbidity rates and comparable mortality rates. We describe our initial experience with Laparo-Endoscopic Single Site (LESS) colostomy reversal. 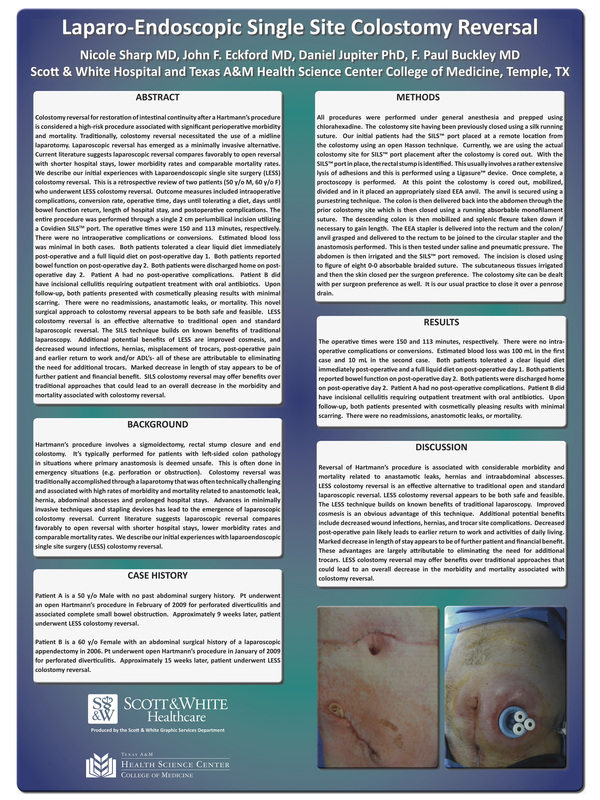 To the best of our knowledge, this is the first publication of LESS colostomy reversal. We describe a retrospective review of two patients (50 y/o M, 60 y/o F) whom underwent LESS colostomy reversal. Outcome measures included intraoperative complications, conversion rate, operative time, days until tolerating a diet, days until bowel function return, length of hospital stay, and postoperative complications. The entire procedure was performed through a single 2 cm periumbilical incision utilizing a Covidien SILS TM port. The operative times were 150 and 113 minutes, respectively. There were no intraoperative complications or conversions. Estimated blood loss was minimal in both cases. Both patients tolerated a clear liquid diet immediately post-operative and a full liquid diet on post-operative day 1. Both patients reported bowel function on post-operative day 2. Both patients were discharged home on post-operative day 2. Patient A had no post-operative complications. Patient B did have incisional cellulitis requiring outpatient treatment with oral antibiotics. Upon follow-up, both patients presented with cosmetically pleasing results with minimal scarring. There were no readmissions. There were no anastamotic leaks and no mortality. This novel surgical approach to colostomy reversal appears to be both safe and feasible. LESS colostomy reversal is an effective alternative to traditional open and standard laparoscopic reversal. Operative times were actually less than those noted in a recent series looking at laparoscopic reversal. The LESS technique builds on known benefits of traditional laparoscopy. Additional potential benefits of LESS are improved cosmesis, and decreased wound infections, hernias, misplacement of trocars, post-operative pain and earlier return to work and/or ADL’s- all of these attributable to eliminating the need for additional trocars. Marked decrease in length of stay appears to be of further patient and financial benefit. LESS colostomy reversal may offer benefits over traditional approaches that could lead to an overall decrease in the morbidity and mortality associated with colostomy reversal. Further studies will be needed to assess LESS colostomy reversal.